21 Broadcasters around the world will provide coverage of the Tour de France, see the full list and links to video at Steephill.TV (scroll to the bottom of the page) www.steephill.tv/tour-de-france/. See the Eurosport TV Schedule. Also Tour de France on TV; TV broadcast schedule compiled for you by Paddy Sweeney at VeloPeloton. If you want to watch the race on your computer you have two choices based on your personal schedule. If you can watch the race during live hours - watch for free. If you cannot watch Live, then pay for on-demand, or watch the short recap video links provided by Steephill.TV for free (usually 3-10 minutes long). For free online live (and recorded) coverage - both Steephill.TV and Cycling Fans compile the best online links for viewing. They will usually indicate where access is restricted, and in what language the audio commentators will speak. Steephill.TV also compiles the best list of articles and videos, before and after each stage, with good photos after. For paid (Live, on-demand, tracking) web video you must purchase viewing rights through NBC Sports (with a MapMyRide account and a social network sign-up), join NBC Tour de France LIVE powered by MapMyRide for $29.99 for the entire race or $4.99 per stage. 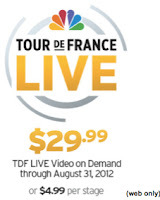 In the USA, the NBC Tour de France LIVE app is sold separately from the web application. Search for it on your phone (app image below). The cost is a whopping $14.99. 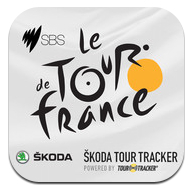 The tracker app for iphone, ipad, Android (restricted regions) is this one (app image below), called the SBS Tour de France Skoda Tour Tracker 2012, download at thetourtracker.com/. SBS is the Australian broadcaster. For interesting written updates/commentary follow Live Update Guy (live text updates), Steephill twitter updates (steephill text updates), or CyclingNews.com text updates. Twitter: If there is any one person I would recommend following on Twitter it would be Aussie Edy Budicin @edbud68, he sorts through and offers the best he finds out on the web and on Twitter - he will point you straight to the good stuff without wasting your time. Also the @Orica_GreenEDGE team is producing Backstage Pass videos that should be fun and informative throughout the tour. Maxime Monfort @maxmonfort is also worth a follow, so is Robbie McEwen ‏@mcewenrobbie, Manuel Quinziato @manuelquinziato, Jens Voigt @thejensie and Paul Sherwen @PaulSherwen. VeloPeloton will bring you great local photography of the Pyrenees @velopeloton. And of course, please follow me @karenrake. Or see a general list of riders and teams on Twitter at Who to follow at the Tour de France - Riders & DS. The first rider in the Day 1 Prologue will start at 14:00, the last rider will finish at 17:25. 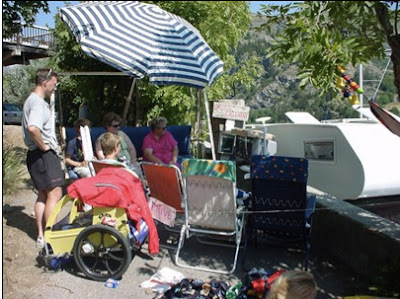 Most standard Tour de France days expect the Caravan to begin around 10:20am, the riders to start between 12:00 and 12:30 and finish shortly after 17:00. If you live in New York (EDT) NBC Sports Network will begin broadcasting between 6:30 to 8:00am, each stage should finish between 11:00-11:30am. For fans viewing in MST the stage finish should be between 9:00-9:30am, PST 8:00-8:30am will be the approximate finish time each day. Record the race if you can to watch later in the evening after work with your family (but avoid all social media and twitter unless you want the finish spoiled). If watching live online, scan Steephill.TV for links and keep 2 different browsers open. When one channel goes to commercial you will not miss out on race coverage (or scenery), try listening to the race in another language. Also the timing, clarity or camera angle is often different depending on the broadcaster - I look for the best option. If you really want to know what is going on in the race, also read live text coverage by CyclingNews.com. They often give better news on rider positions, time gaps, and breakaways.